The New Bern Avenue Corridor study has been going on for over a year and the final draft report is now available. You can view it on the City of Raleigh’s study page here. The twenty-seven page pdf goes through all the issues of this corridor and lists recommended actions to take in order to improve the study area. The city is looking for comments about it so get them in before January 2. Here’s how. One piece of the corridor study that I commented on was the bicycle lanes. The study recommends a new street layout. Picture of that below. The one-way streets of Edenton and New Bern are laid out, going left to right, with two vehicle lanes, a five foot bicycle lane, and an eight foot vehicle parking lane. The two way section of New Bern has a similar layout on both sides with a median in the center. Great work on the final draft of the study. I did want to pass along some comments of mine as I read through the report, specifically about the bicycle lanes.I hope that the city can consider an upgraded plan for cycling along this corridor to be implemented either with this New Bern vision or at some later time when funding becomes available. The plan in the report shows that a cyclist can ride in a five foot wide travel lane with parked cars to the riders’ right and moving traffic to the riders’ left. In this layout, a cyclist is at risk of injury with cars entering/exiting parking spaces as well as at risk of being “doored” by unaware drivers exiting their vehicles. Buses will also stop within the bicycle lane in order to drop off and/or pick up new riders at bus stops. Since the New Bern Corridor has the highest ridership of any Capital Area Transit (CAT) bus, the chances for this to happen is high especially in the coming years if transit grows in Raleigh. Regarding conflicts with bicycles crossing an intersection and vehicles making right turns, more research needs to be done on a way to have both parties yield correctly to avoid any nasty incidents. Other cities have found ways to accomplish this and I’m sure Raleigh can implement it as well. I really think there is an opportunity for cycling in Raleigh to continue to grow with changes like these. If something like this existed from downtown all the way to WakeMed, a distance of three miles, then I think this corridor would be a truly mixed use transit corridor and spur lots of the great development that many participants in the study area asked for. This would allow for people to get around in many ways and helps preserve the neighborhood character on both sides by keeping the area at a more human scale. Hope to see something like this in the future. Thanks a lot. So the dedicated bicycle lane in the recommended plan may not really improve things for cyclists then the current layout of New Bern Avenue and Edenton Streets. In my opinion, the current layout of three, and in some places four, travel lanes with no parking spaces allows a cyclist to move down the street more safely. Cyclists can travel with the curb to their right and plenty of space on their left for cars and buses to pass. The recommended layout with the bicycle lanes may force encounters between cyclists and cars parking as well as buses making their stops. I think if Raleigh was really serious in building cycling infrastructure, the New Bern Avenue corridor needs more study on this topic. I hate to see similar problems in this area to the ones on Hillsborough Street’s bicycle lanes. If anyone has more knowledge on the topic, I’d love to hear your thoughts on this. This plan for a bike lane on New Bern needs to be scratched and completely re-done. Comments are being polite. Whoever put the 27 page plan together is clueless. Here we go, wasting time. Enough talk about funding. If you cannot re-do the street correct, do not do the project at all. Hillsborhole bike lanes are pathetic. Anyone every drive Glennwood Avenue in the direction of Crabtree. So called bike lane exists and it abruptly ends, putting the bike rider in danger. The city is asking for lawsuits by cutting corners and not planning properly. Black decorative fencing nneds to seperate the bike rider from any traffic. bike lanes go aganist curbs with fencing seperating the bike lane from parking and traffic. This is a no brainer, get your heads out of your pants Raleigh planning, especially this New Bern Ave group. You have accomplished nothing and the tax payers are paying your jobs. I’m sure there have already been studies, but are bike lanes in general effective in safety, increasing ridership, and so on. Every time I ride in one I don’t feel any safer than the old rule of having bike traffic flow the same as the car on the same street. If anything it seems to tell cars, go as fast as you want and don’t worry about us, but we’re still there in close proximity, making it more dangerous. I would much rather see bike friendly designs on Jones/Lane or Hargett/Martin than on these streets. The is the most busy corridor coming from and going to the east. Heavy bike traffic does not have to follow heavy car traffic. This is something that I quickly noticed biking in Portland: there was a separation of car and bike routes. If they extend the lanes all the way out of town, then I would be a fan, but as it is now there is not much need for the lanes on such a short section. I live a block away from this and have no problem never biking on Morgan/New Bern. Bikes lanes or not, if the lane is not separated from traffic, the general population will not be comfortable biking on New Bern. That being said, I agree with this design being totally flawed. The city seems to just plop bike lanes down without caring if they actually work. Hillborough is bad. Salisbury is in the door zone. Glenwood goes nowhere. Milburnie is used as a parking stripe. Ridge Rd is only open part-time. The only good one I know is Reedy Creek. If lanes go on this street, then it should be separated from parking. I would offer another suggestion if they can’t separate the bike traffic: put the bike lane on the left, where there are no buses pulling over or parked cars. I completely agree with the comments so far. The protected and separated lanes should be required here with no doubt. This is a crucial section that could provide a huge loop in the Greenway system to connect the trail that currently terminates at WakeMed to downtown and all the neighborhoods in between. Off topic, but to the point of random bike lanes… the city has a study to stripe bike lanes along Anderson Drive between Glenwood and Six Forks. I don’t see this happening since it would take away 100% of street parking for residents here. Or I could see people just parking in the bike lanes anyway. Some very haphazard planning going on indeed. Beware of bike paths and lanes. They give cyclists a false sense of security. Visibility is safety. Bike lanes and bike paths make cyclists less visible to other road users and result in more collisions with motor vehicles. Ask transportation engineers and government transportation officials why they dismiss the safety studies. Thanks for your feedback about the corridor plan. In the interest of making this a fair and open dialogue, I’d like to suggest we stick to content and be a little more civil. While it’s entirely possible that my head is indeed inside my pants, disparaging us isn’t going to get us anywhere. 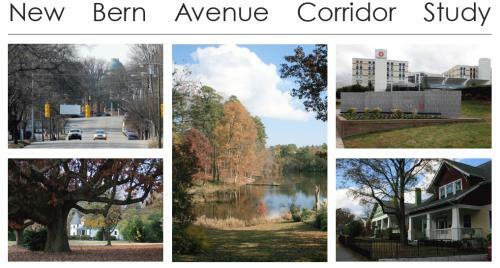 The corridor plan’s fundamental philosophy is to change the character of New Bern and Edenton west of Raleigh Boulevard to a more urban landscape. This holds true for the land use relationship to the street and for the function of the street itself. The City is proposing to reduce the number of travel lanes uniformly from three to two in each direction and adding on-street parking. East of Raleigh Boulevard, the plan is more suburban in nature and provides wide outside lanes for cycling. The City’s Bicycle & Pedestrian Advisory Commission reviewed this plan at their last meeting and found the concepts generally favorable. Leo’s idea to add protected bike lanes between the parked cars and the curb is interesting in this context and may warrant future exploration. I greatly appreciate the fact that he provided examples of how this is done in other cities, especially with respect to the fixed-rail transit integration. My biggest concern with this type of design is managing transitions at intersections and facilitating left turns for bikes. I would encourage all of you to check out the City’s adopted 2009 bicycle plan, which calls for over 300 miles of new on-street bike lanes around the City. We have been taking an incremental approach so far by piggybacking City and NCDOT capital and maintenance projects (hence the bike lanes on Glenwood, Spring Forest, Blue Ridge, Salisbury, etc. ), however we will be rolling out more standalone bike marking projects over the next year. This next batch of projects will include shared lane markings (sharrows) on Hargett Street from West Street to Tarboro Road. The plan has a goal to increase bicycle ridership Citywide. Research has been conclusive that higher ridership leads to improved cycling safety in communities, and that the way to encourage more ridership is to provide facilities that encourage cycling. This model has been supported in other cities like Portland and Minneapolis that made pro-bike infrastructure investments and saw good returns on that investment. I would also suggest that constructive comments all be sent to the contact Leo provided. The city needs to see this feedback, and we all should encourage others (especially anyone that lives in this part of town) to read up on these various plans and provide their opinions too.